And then the Bishop(-elect) of Sheffield, Pete Wilcox, chipped in with the featured tweet, which is basically an episcopal exhortation to vote Labour, or the puppy gets it the poor will pay for it. Or, more accurately, it was a warning not to vote Conservative, or the plight of the poor will be made worse. Yes, a vote for Theresa May is a sure and certain vote for poverty, hunger and homelessness. This was rather a stark intervention during a General Election campaign. O, yes, we know that the College and House of Bishops is jam-packed with staunch Socialist Europhiles, each persuaded that Jesus, were he around today, would surely swagger for Jeremy Corbyn (or Tim Farron, now he’s recanted of his sin). He might even vote SNP for greater justice and equity, or Plaid Cymru were he to walk upon the Brecon Beacons, or the SDLP in Northern Ireland. But there’s no way on God’s earth that he’d touch the Tories with the longest barge pole in Britain. This profound shaping has become an inescapable framework: ‘northern’ and ‘urban’ is antithetical to conservatism; foodbanks and unemployment are the price you pay for Toryism. And if you challenge Dr Wilcox on any of this, he adopts a superior judgmental tone: “I can’t help wondering if you’ve ever lived in a place like Gateshead, Walsall or Liverpool? 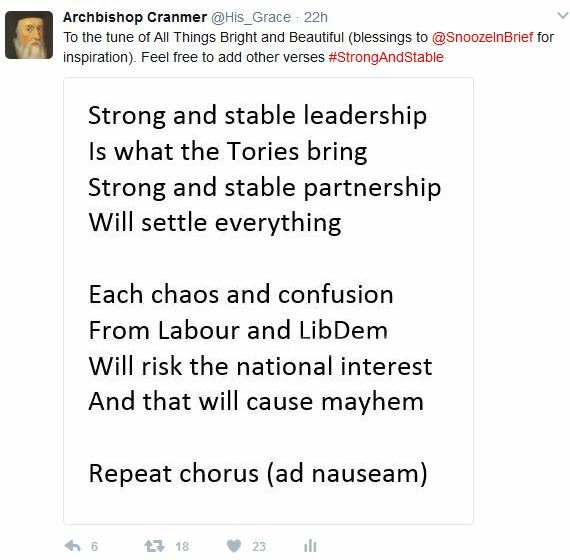 Or indeed Sheffield”, the Bishop(-elect) responded. It is inconceivable to him that any rational, intelligent, discerning person could live in any of those places and possibly come to a different view from his of Tories and Toryism. The previous Bishop(-elect) of Sheffield, Philip North, was hounded out because a few hundred clergy and few hundred supporters of women’s ordination felt there was no remote possibility that he could ever be their bishop: his appointment was seen to be divisive and regressive for a “go-ahead, vibrant, progressive city” like Sheffield. Some 4,917 people voted Conservative in Sheffield Central in 2015. Another 7,242 voted Conservative in Sheffield South East; 7,544 voted Conservative in Sheffield Hallam; 6,792 in Sheffield Heeley, and 4,407 in Sheffield Brightside and Hillsborough. The Sheffield Diocese is, of course, far wider than just the city’s parliamentary constituencies: many, many thousands of people live in the Diocese of Sheffield and vote Conservative (and tens of thousands more in Gateshead, Walsall and Liverpool). And then we could throw in the 32,170 who voted Ukip across Sheffield (and the tens of thousands more in Gateshead, Walsall and Liverpool). Does Pete Wilcox think they’re all mentally deficient and morally delinquent? Is it really not possible in his worldview to be a Christian and vote Tory and care about the poor, sick and disabled? Are his Tory-supporting flocks in Liverpool and Sheffield so dumb and insensitive to the evil that Thatcher meted out that they refuse to see that a vote for Theresa May and her party is a vote for more poverty, suffering and suicide? 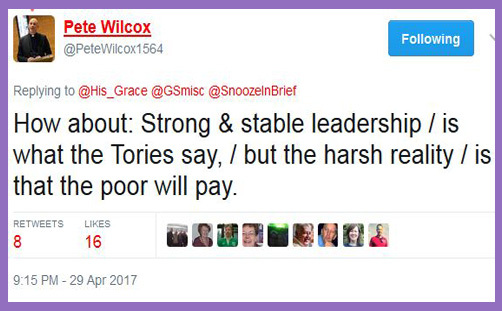 It is obviously pointless guiding Dr Wilcox to reports or statistics on higher employment or to progress on tackling poverty: they’re doubtless just Tory lies and damned lies (mediated by a malignant right-wing Tory press). What is clear, however, is that the second-best Bishop of Sheffield has set his face against tens of thousands of his parishioners, all because Faith in the City (of 30 years ago) “profoundly shaped” not only his whole Christian ministry, but his indelible view of the Conservative Party and all those who are cold and callous enough to support it. Vote Tory, and the poor will pay. Tories of Sheffield, how can Pete Wilcox possibly be your bishop?